Benefits Cholesterol - The fatty acids found in fish provide heart health benefits, and so do the very-long-chain fats and alcohols of honeycomb. The fatty alcohols that honeycomb is made of appear to significantly lower bad cholesterol and raise good cholesterol, according to a review published in the March 2004 issue of the journal Experimental Biology and Medicine. In humans, clinical data in one study showed honeycomb fatty acids and alcohols lowered low-density lipoprotein by 21 to 29 percent. 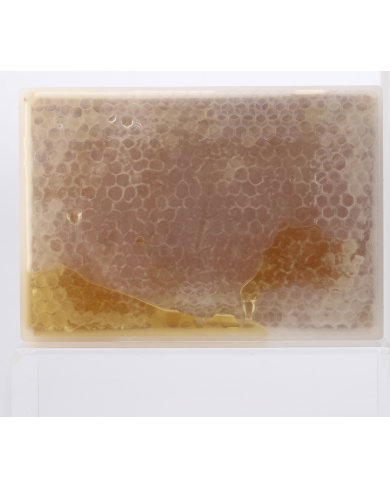 Protects the Liver - The alcohols found in honeycomb appear to have antioxidant effects that help protect your liver. To test this, researchers conducted a study using a mixture of beeswax alcohol to evaluate the safety and effectiveness in people with fatty liver. Participants took a preparation of beeswax alcohol for 24 weeks, and at the end of the study researchers found that it helped normalize liver function and improve symptoms of fatty liver. The study was published in the July 2013 issue of the Korean Journal of Internal Medicine. Economic Benefits - Beekeeping involves the management of beehives and working bees; however the economic treasure is in the honeycomb. The comb is where the honey and pollen are stored; it is also made from beeswax. According to the University of Illinois, honey production from about 135,000 American beekeepers managing approximately 2.44 million bee colonies produce an estimate of $150 million worth of honey. Healty Benefits - Honey is effective in treating minor abrasions because it contains antimicrobial agents. Dweck writes that the natural honey contains more potent minerals and vitamins than processed honey. Magnesium, iron and potassium are among the minerals produced from natural honey. It also contains vitamins thiamin, riboflavin, ascorbic acid, panothenic acid and nicothenic acid which are essential nutrients that promote cellular damage repair and reduces chronic disease. To Use: Cut a bite-sized piece of honeycomb from the block. Pop it in your mouth and chew it like chewing gum. This will release all of the honey. You can eat the wax if you like, or remove it once the honey is gone. It definitely taste great.